Tungsten alloy rod	is produced by pressing and sintering into billets, which are worked by rolling or swaging into tungsten alloy rod. Smaller sizes are produced by subsequent drawing. Tungsten heavy alloy rod is produced in straight random lengths with a smooth swaged surface at diameters 3mm and larger, and with a smooth drawn finish below 3mm. A centerless-ground finish can also be furnished. Specific lengths and special fabrications can be supplied upon request. These kinds of tungsten heavy alloy rod could be machined further, which are usually used to making the parts of counterweight, radiation shielding, military defense appliance, welding rod, extrusion die, also for some sports fields, such as darts, billets, golf club, etc. Besides, we can manufacture and offer tungsten alloy rod as the counterpart of Anviloy 1150, whose properties are much similar. As tungsten heavy alloy's high density, high melting point, small capacity, excellent hardness, superior wearing resistance, high ultimate tensile strength, etc. 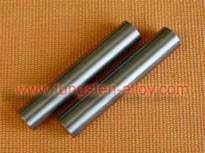 Tungsten heavy alloy rod is increasingly welcomed by public. Chinatungsten can offer various types with different functions for customers, and we can not only manufacture according to the international standard, but also can design the products as per the requirements of customers. For more details, you should contact by telephone 86 529 5129696, or email to sales@chinatungsten.com sales@chinatungsten.com . Any enquiry or questions will be warmly welcomed.